The other day I was sitting outside with the kids, watching them scribble on the side of the house with colored sidewalk chalk. It was a beautiful, sunny day, with a mild breeze to offer some cool relief from the warmth of the sun. As I sat on the steps to the deck and surveyed the world around me, I felt a deep sense of satisfaction, peace, and gratitude. 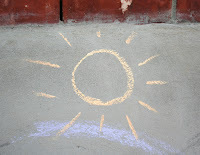 Inspired by the joy that bubbled within me, I picked up a coral-colored piece of chalk and drew a picture of the sun on the side of the house. The bright color cut through the dingy gray concrete to produce what struck me as a very happy image. I sat back and admired my artwork. I didn’t intend to show it to anyone else, and was in fact pretty sure that nobody else would ever see it since busy little hands with lots of chalk hovered nearby. But that didn’t matter. I just wanted to do it, regardless of whether or not anyone else would ever see it. Why do we do things like this? I used to wonder about stuff like that when I was an atheist. Why would the human animal, a collection of chemical reactions produced by blind evolution alone, different from gnats and snails only in terms of complexity, feel such deep satisfaction in making a series of marks that represents the star that’s about 93 million miles away from our planet? For that matter, why would he feel “awe” at the atoms that make up the material world around him in the first place? (Especially at things like mountain ranges that only make survival more difficult — it seems like he should have evolved to loath such a sight.) And, most perplexing of all, why would he ever feel grateful when observing his planet? Humans typically only feel that emotion when something has been given to them by another intelligent being. Why does the human animal feel “grateful” when he observes the “beauty” of the world around him? What evolutionary process led to this odd instinct? After thinking about this sort of thing and occasionally discussing it with friends, I came up with some answers that offered some explanation for these feelings and behaviors. But they never quite sounded accurate. I always felt like there was something missing from these answers, that they had that hollow ring of a theory that contains some truth but is missing detail and depth. Now, of course, I see what was missing. I felt awe at creation because it has a Creator, its beauty evidence of the Source of all beauty. I could see the glory of my normal, day-to-day environment (a place that if I were a mere animal I should see only as a means to an end for survival) because it reveals something of God, and because I know deep inside that this is not my real home, and that I’ll only be in this place for a while. And my desire to pick up a piece of chalk to give an outlet to my joy and wonder in the form of a picture of the sun came from that yearning we all have for the sacramental (to use the term loosely), those things that bring the realities of that unseen realm of which we’re all aware here into the material world for us to see and hear and touch. And that spontaneous, instinctive feeling of gratitude for my life and the world around me came, of course, for the same reason I feel grateful about anything else: because something has been given to me, probably undeserved, by someone else. That little drawing was just one of many examples of how much more life makes sense to me now that I am a Christian. I still think that the universe is made of atoms and that we are creatures who feel sensations through the firing of neurons in our brains, who demonstrate certain behaviors that we came by because evolutionary processes selected for them in our species. But now I know why we feel “awe” at the “beauty” of our environment. And now I know why we draw pictures of the sun. I had a little girl in my class (just turned 7) arrive for the school day and announce “I feel like I just want to say ‘thank you’ to everyone today.” And she meant it. It made my morning very precious just to be able to be near such a wee bundle of gratefulness!